Handle Overall Length: 11.0-29.0 in.lbs. / 1.0 in.lbs. The 05074734001 Wera Kraftform 7400 Series 7446 ESD Adjustable Torque Screwdriver with Rapidaptor is one of thousands of quality tooling products available from MRO Tools. Please browse Wera ESD Series Tools for tools similar to the 05074734001 Wera Kraftform 7400 Series 7446 ESD Adjustable Torque Screwdriver with Rapidaptor. 05074734001 Wera Kraftform 7400 Series 7446 ESD Adjustable Torque Screwdriver with Rapidaptor description summary: Wera Kraftform 7400 Series 7446 ESD Adjustable Torque Screwdriver with Rapidaptor. Point Size: 1/4'' Adjustable Torque Range: 11.0-29.0 in.lbs. / 1.0 in.lbs. 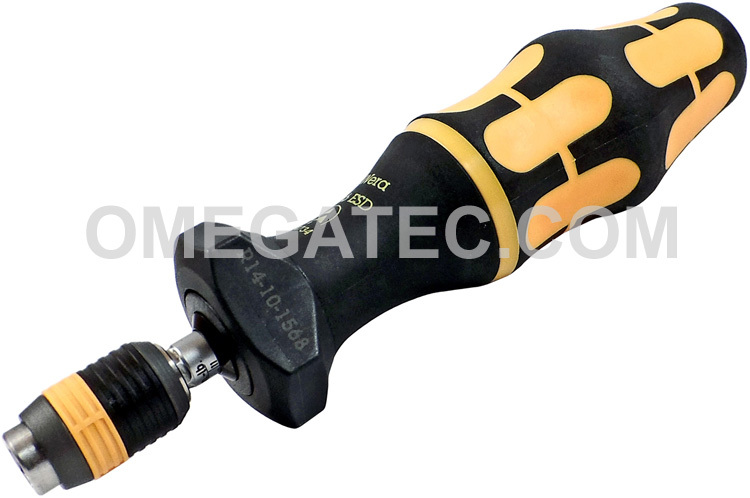 Overall Length: 155mm / 6'' Quantity discounts may be available for the 05074734001 Wera Kraftform 7400 Series 7446 ESD Adjustable Torque Screwdriver with Rapidaptor. Please contact MRO Tools for details.